Reptile Tile is one of the most remarkable bands working in this era of music. They have enough musicians to start a soccer team. The core members all use cheeky pseudonyms: Terry Cloth, Ellen Degenerate, Ken Shiro, Kiwi Clementine, Bury White, Peter Chopoff, Tanith Fox, Door Ajar, and Lorenzo Mozo. They frolic through genres like sonic Scott Bakulas in Quantum Leap and continue to put out more music — sometimes on a single record — than some acts do in an entire career. Stolen sounds that defined past decades come alive in new ways while absurd experiments burst into flame… some flaring out and others occasionally surging into the realm of the indispensably catchy, wickedly hilarious, or quietly contemplative. In November of 2015, someone suggested I review Reptile Tile’s latest offering. RTT Greatest Hits, a witches brew of 63 tracks lasting nearly three hours, sounded like Talking Heads and the cast of Monty Python hijacked Pink Floyd while they were recording The Wall. I quickly did the math and said no thanks. By the following June, Reptile Tile doubled down with Hot Tropic, with 134 tracks clocking in at almost seven hours. Driving home from New Orleans in July, I started listening to Reptile Tile en route to Virginia. The idea of pairing two long journeys convinced me to scale the Hot Tropic mountain; I call it my Mount Everest. Four months later, I reached the peak, writing an article featuring an impressionistic account of every single track. Reptile Tile captured my attention and imagination, evident in over eighty pop culture references and comparisons. Ken Shiro joked that they were trying to help me get my Master’s in music journalism. I haven’t written about an album since, but Reptile Tile remains the audio trainwreck I can’t stop listening to. A prevailing question has lingered for two and a half years: how might Reptile Tile one-up themselves after giving birth to one of the largest, longest, and strangest musical creations in recorded history? The simple answer only leads to more questions about the labor involved in Reptile Tile vs Human Man, an album manufactured by tough choices. Which songs should be included? Where should they live on the track list? What experiments should be set aside? Does this song need an extra layer of synths or a brassy conclusion? What sounds should be pushed to the front or back during the mixing? In a series of interviews with the band, I first spoke with Terry Cloth, a member of Reptile Tile that swings between the songwriting and sound mixing. TC: The band has changed a lot since it started. Reptile Tile is kind of like a shape-shifting hydra with many heads. In making our desires and visions known to one another for each song, there are times when it seems like a struggle to be heard or understood. We’ve gotten much better as a group, communicating and respecting one another. Ken Shiro, a member known for his ambient instrumental contributions and organizing shows at Charlie’s American Cafe in Norfolk, had more to share on Reptile Tile’s collective struggle. KS: The recording began right as Hot Tropic was coming out (June 2016) and everyone was in a liminal state – exhausted, euphoric, angsty. Right away the songs had a different tone. The previous album had a lot of upbeat, funny, and rambling experiments. Most of the new songs were catchier, more direct, but also kind of sad and downbeat. Next, I spoke with the mix master, Lorenzo Mozo, who began as a fan of the band that offered to help them record live shows. LM: I’d just taken it on as a hobby: making multi-track recordings and mixing them. I recorded Live at Charlie’s American Cafe, and the band loved it so much they actually released it. After that, I weaseled my way into the Reptile Tile apparatus. I came in on the ground floor of Luke’s Earthworm – Trapped in LA, a good mix of bangers and mash. Reptile Tile vs Human Man had already been building up for a year and change. Their eyes would glaze over whenever they’d talk about it. Terry Cloth, Ken Shiro, and Lorenzo Mozo each had something to say about the difference between Hot Tropic and Reptile Tile vs Human Man. TC: It’s our first record where we utilized modular synths. We have a lot of guest vocalists, horn players, and other instrumentalists. It was a very collaborative effort. KS: So the initial concept of the album was a really concise collection of songs, unified by the catchy-but-sad tone, but we also wanted to get deeper into the production. To me, all the songs contain this feeling of making contact with an other, the excitement that goes along with that, and the eventual disappointment when you realize there are distances between the two of you that can’t be bridged or fathomed. I think the album holds together as our most cohesive to date. LM: It feels like a bid for pop stardom. It might be too clean… like Reptile Tile showering, shaving, and going out in their Sunday best. I loved Hot Tropic because it was so in the moment, warts and all, embracing flaws and amplifying them. TC: Our songwriting process is really all about creative freedom, allowing songs to cultivate themselves and grow, similar to plants. We’re like sonic gardeners, harvesting the music when it is ready. Next, I called up Kiwi Clementine and Ellen Degenerate while they were at their home in Smithfield. We chatted a little about their dogs, chickens, and bees… and how much money they spent on Lyft rides to make it to recording sessions in Virginia Beach after they gave up their car… but inevitably talk turned to the record. KC: The old philosophy of the band was open-source, very collaborative. It was an experiment to see if we could maintain a tangible sound while consciously pursuing the eclectic. When the Human Man EP came out, some band members were using it to contact labels and distributors and we were contacted by some PR people. ED: Personally, I would love to tour. It helps me get into character and creates an aesthetic barrier. But I don’t really care if we’re on a label. KC: We do want more people to listen. We plan on shooting more music videos. We were honored to work with Mandek Penha on “We Are Not a Cult”. 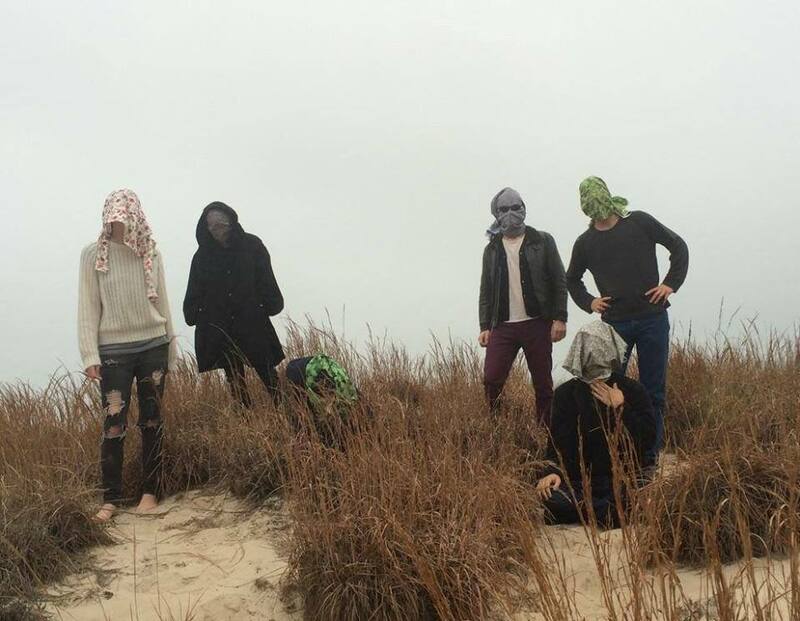 Between the two albums after Hot Tropic, Luke’s Earthworm – Trapped in LA and Insect Buffet, the band released a music video with Mandek Penha late in 2017. I ask the band how they got involved with the small Australian church. KC: Mandek Penha had played a show somewhere with David Liebe Hart (the puppeteer from Tim and Eric Awesome Show). Ellen and I had known about him for a while. So did Bury White; he was the one that contacted him. TC: We heard the song “Men Teach The Boiz (Girls Kiss The Boiz)” and were all blown away by it. We got in touch with him and he was incredibly supportive. We all joined his church, The Church of Sarrean Alignment; everyone in the band is a member now. We recorded “We Are Not a Cult” and left a spot for him to fill in a verse. He was excited about the song and suggested we make a video for it. I asked about their collective commitment to The Current Earthly Embodiment of Mandek Penha. Lorenzo Mozo referenced the origin story of the church. LM: Well, none of us are sporting Korean tattoos. As for the future of this dysfunctional music family, Reptile Tile vs Human Man does not appear to be the last chapter. KC: It’s a way to get your feet wet. The idea is to get people to listen to the longer recordings. We’re converting you. We’re already working on our next release. 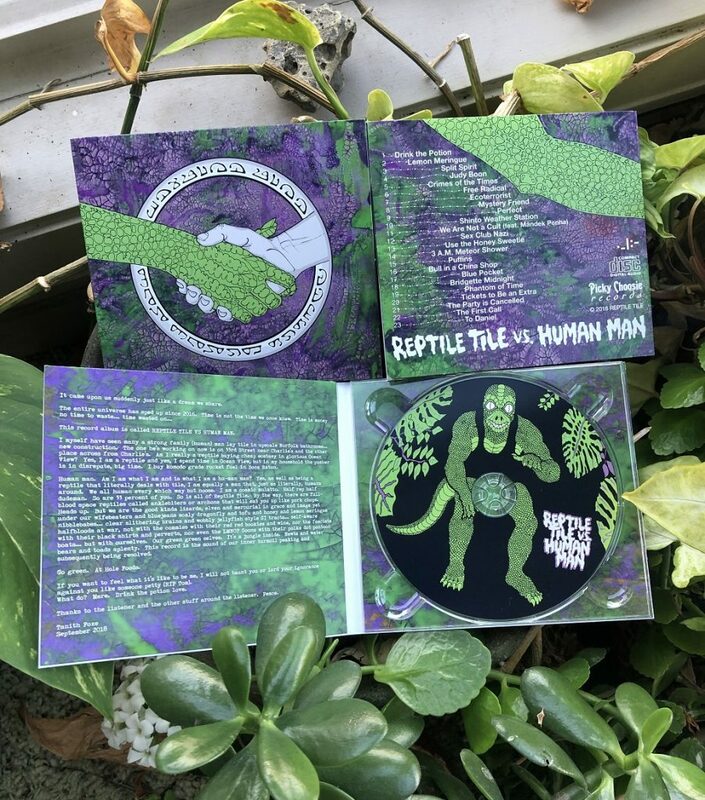 In the meantime, Reptile Tile vs Human Man is available on CD through Picky Choosie Records or via Bandcamp. A limited run of Hot Tropic on four-cassette vinyl albums is available from Hand to Mouth Tapes. Contact the band at [email protected] for booking. D. T. Jones has previously written about music for Landmark Media, Whurk Magazine, AltDaily.com, and POPSCURE. He is also sometimes a screenwriter, a poet, and a purveyor of bad jokes.